100 Pandas is an online video slot machine game from IGT (International Game Technology) that has been released in February 2013. This online video slot game has 5 reels and a whopping 100 pay lines! The theme of 100 Pandas (first name obviously indicates for the 100 pay lines) is inspired by the wondrous beauty of the great bamboo forests in central China and the incredible wildlife that resides out there, mainly giant pandas. Did you know that 100 Pandas is the FIRST ever online video slot game of IGT that offers 100 awesome pay lines for you to bet on? What online slots players initially love about this 100 Pandas online video slots machine game is its cool Stacked Wilds! Not only that, this game also has a Free Spins bonus game wherein the Stacked Wild symbols are more abundant than in the main game, and you can even re-trigger the Free Spins again and again, up to a max of 255 Free Spins! IGT is very generous when it comes to their wide array of online slots that they typically welcome anyone who is interested to play for free on any of their games (free play), without requiring them to download anything at all. If you liked watching Kung Fu Panda animated cartoon movies and you like to see wild animals in their natural habitat as well, then 100 Pandas is the video slot machine game that is worth your while! 100 Pandas features scatter wins, Stacked Wild symbols, Free Spins (wherein you can get up to 255 Free Spins plus more Stacked Wild symbols than in the main game), a maximum win of 250,000 credits, and last but not least, it has a 93.04% to 96.52% theoretical average return to player (RTP)! What online slot players can expect from IGT’s 100 Pandas is that it is packed with stunning animation graphics and realistic sounds, and an awesome bonus feature to make sure that all those who play will totally be entertained with this online video slots game. Most online slots players loved this game immediately the moment they have laid their eyes on it! They say it’s very entertaining and there are many times that you get very lucky even if you have only deposited a low amount. The setting of this slot game is in a great forest full of bamboo trees – the perfect setting for a family of panda bears to live peacefully (and munch as many baby bamboo shoots as they like). The symbols are drawn in a life-like manner and they become animated when involved in winning combinations. The overall graphic design of 100 Pandas displays a wide array of vibrant colors, and since the setting is on a thick bamboo forest, it is not surprising that the main color of this game is green. Other colors used in the 100 Pandas online slot game include blue, orange, red, yellow, black, white, pink, purple and gold. As for the sound, 100 Pandas has a relaxing and tranquil Chinese background music (flute) accompanied with chirping birds and delicately creaking bamboo. Whenever you hit a win, your rewards are accompanied either by a Chinese gong, or fast-paced and louder Chinese background music (for big wins). The card deck symbols used in 100 Pandas are 9, 10, J, Q, K and Ace, designed in Asian-inspired writing, as befits the theme of this slot game. The other regular symbols that were used also perfectly complement the theme of 100 Pandas, and these are: the Bamboo shoots, Lotus Flowers, and of course, two Pandas (one in a green background, the other in blue). The Wild Symbol is the Family of Pandas walking in the moonlight. It acts as a substitute for all other symbols (except for the scatter symbol) in order to help you complete a winning combination. It is entirely possible for you to get up to 4 or more Family of Pandas wild symbols to appear simultaneously on a single reel, which makes up a “Stack” of Family of Pandas wild symbols. The Family of Pandas wild symbol can be a Stacked Wild, and it can increase your chances of winning, by massively substituting for other symbols in order to help you complete numerous winning combinations! The Scatter Symbol is the Yin and Yang Bonus symbol. Scatter symbols mean that they do not need to appear in a line (on an enabled pay line) for you to win. The Yin and Yang scatter symbol can be scattered anywhere on the 2nd, 3rd, and 4th reels only. When 3 Yin and Yang Bonus scatter symbols come out anywhere on the 2nd, 3rd, and 4th reels at the same time, you will trigger the 100 Pandas Free Spin Bonus Feature game, wherein all your winning combinations there will be awarded with a 2x multiplier! 100 Pandas Free Spin Bonus Feature Game – If you manage to get 3 Yin and Yang scatter symbols anywhere on the 2nd, 3rd and 4th reels, you will activate the 100 Pandas Free Spin Bonus Feature game. You will begin playing the 100 Pandas Free Spin Bonus Feature game with 10 Free Spins plus all your winning combinations formed within the Free Spin games are multiplied x2. The reels in the 100 Pandas Free Spin Bonus Feature game have more numbers of Family of Pandas Stacked symbols as well as Yin and Yang scatter symbols than in the regular 100 Pandas online slots game. While playing the 100 Pandas Free Spin Bonus Feature game, you can re-trigger the Free Spins by just getting 3 Yin and Yang scatter symbols (anywhere on the 2nd, 3rd and 4th reels), which will award you another set of 10 Free Spins! The Free Spins can be re-triggered multiple times, up to an awesome maximum number of 255 Free Spins per 100 Pandas Free Spin Bonus Feature game! The additional Free Spins are included to your remaining number of Free Spins. The maximum amount of Free Spins that one can win during a 100 Pandas Free Spin Bonus Feature game is capped to 255 Free Spins. The maximum winning amount on any transaction is limited at 250,000 currency units ($, for instance). 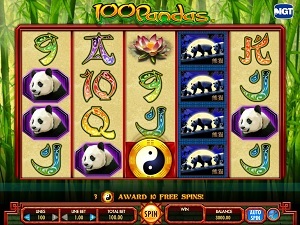 A transaction typically includes the results of the Free Spins and the outcome, which activated the 100 Pandas Free Spin Bonus Feature games. Once the 100 Pandas Free Spin Bonus Feature game is over, you will be then taken back to the main 100 Pandas online slot game, and your winnings from the Free Spin games will be included to your total balance. 100 Pandas has 5 reels where you may bet on as many as 100 pay lines. The minimum bet is 0.01 and the maximum bet is 20.00 per line. Please take note that for every coin that you wager, you will enable another pay line. You will be paid out for winning combinations on enabled pay lines only. The maximum win on any transaction is limited at 250,000 currency units (for instance, in dollars). There is an award limit on any single transaction, regardless of the size of your bet. It is absolutely more fun and easy when there is an Auto Spin function available in online slot games. In 100 Pandas, you can access their Auto Spin function by clicking on the (blue) Auto Spin button on the lower right corner of the screen. You are given the choice of how many spins you would like the game to do automatically for you – from as low as 10 up to as high as 50. When you choose a number, say 30, the Auto Spin function will keep track of the remaining number of automatic spins. The Auto Spin will stop only when a Bonus is triggered or the balance is insufficient to spin again. Also, you are actually given the option to stop the Auto Spin yourself, just in case you want to.